Avast me hearty -- a Liberty Slots player just had an amazing winning spree on the pirate-themed Caribbean Gold slot! Harold S. of California took home a pirate’s booty after a $99,000 weekend winning streak. Until July 15th 2017, Liberty Slots is giving players a $10 free coupon to try the Caribbean Gold slot game, or any of its more than 170 casino games (instant coupon: LSCGFREE10). “It was just after midnight on Saturday," the winner explained to a Liberty Slots customer service rep. "I’d been working and needed to unwind so I thought I’d play some slots. I’ve only had an account at Liberty Slots for a few months but I like it because they have some slots that no-one else has, like this Caribbean Gold which is my favorite now, that’s for sure! $10 free coupon available until July 15, 2017 for players that would like to try their luck. Caribbean Gold was introduced by WGS just over a year ago. It's a pirate treasure themed game with a built-in bonus game where players dig for buried treasure on Caribbean islands, doing their best to avoid getting shipwrecked. Players from all over the world enjoy a wide selection of unique online casino games from Wager Gaming at Liberty Slots Casino. 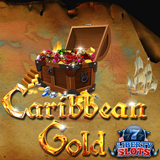 Caribbean Gold is available in Liberty Slots’ mobile casino, compatible with all smartphone and tablet brands, and in the instant-play and download casinos for desktops and laptops.